You can hear those influences in the sinister synths, dramatic vocals and guitar lines of Baby Talk, while Holiday Resort—written about a coming-of-age crisis at 27—recalls the Crystals with its multi-syllabic melodic hooks. RBY sees Houghton truly indulge her love of the theatrical, with rousing guitar leads, strings and samples collectively adding an element of grandeur. The haunting harmonies of closer On The Radio, meanwhile, instantly bring to mind Karen Carpenter. The album features tracks recorded during sessions in Oakland, California and London. The former saw her team up with Jorgen Jorgensen and Sam Durkes, who also play in Ezra Furman’s band, and she describes the time as one of the best of her life. With the exception of the four Oakland songs, everything that made the final cut features Jacob Smedegaard on drums and Houghton doing the rest—lead and rhythm guitar, bass, keys, and mellotron. Her creative reach extends far beyond the record’s instrumentation, though. She produced the LP, took the lead with the direction of its accompanying videos and painted the cover—a jarring, vivid self portrait depicting one of the lowest points of her life. She was able to assert this level of control by funding the album herself, through PledgeMusic. Following our interview, though, Houghton unfortunately found herself among thousands of other artists who have not been paid by the fundraising platform. This has thrown a spanner in the works, but by following her mother’s advice—“don’t let the bastards grind you down”—she has vowed to fulfill all orders, even though she may never see a penny. She has worked too hard to fall at the last hurdle. ‘Lung Bread For Daddy’ finds her pouring out her soul, delving into deeply personal topics such as mental illness and identity, and how the latter ties in with relationships and gender. 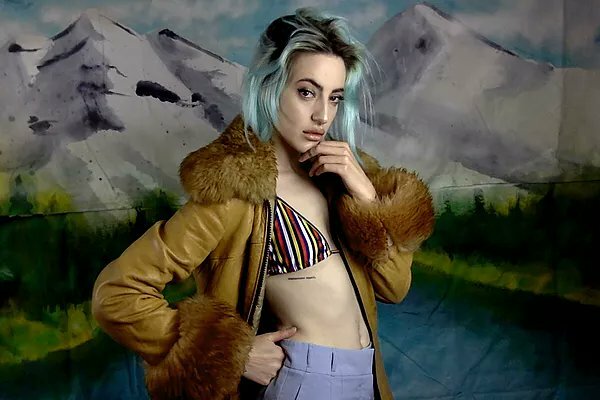 Du Blonde explained in a recent interview with the Line of Best Fit that she identifies as non-binary. “I am not a ‘woman’, ‘lady’ or ‘girl’. I’m trans. I’m non-binary, I identify predominantly as male,” she said. We caught up with Du Blonde to gain more insight into what is already a fearlessly honest body of work. I know it may be a cliched question, but with such a unique album title I’d like to ask about the story behind it? My old drummer Jacob calls tobacco ‘lung bread’. While we were touring we had these different names for each other according to who we were in this weird family. Jacob was daddy, Kristian [Craig Robinson, bass] was mommy, I was the baby. So one time Jacob was asking for a cigarette and he said: “Baby, do you have any lung bread for daddy?” All of my album titles have somehow come from four word sentences friends have said offhand. You have said that you find writing autobiographically therapeutic. Is it also difficult, and sometimes uncomfortable, laying yourself bare? Not at all. I’ve always been pretty direct in how I communicate, both in conversation and through my art and music. I feel to be uncomfortable about it would mean I experience some semblance of shame around the way I’ve been treated or how certain scenarios in life played out, but I came to a place quite early on where I realised feelings of humiliation don’t serve you. Have I made bad relationship decisions? Yes. Have I said things I regret? Yes, of course, but so has everybody else. When some artists delve so deep into themselves for an album they find it hard to then perform those songs live, as it’s as if they’re reliving the moment or feeling, whereas some completely detach themselves. Where do you fall? I don’t think it’s as simple as two sides. I know of a lot of people who detach and people who find it difficult to relive moments when performing, I don’t experience either of those things. In fact, it helps me to go back to that place psychologically, where I was in the moment I wrote it or lived it, and live it again for three minutes. Your life seems to be full of creative outlets, whether it be music, art or fashion. Is it important to always be channelling your energy into something artistic? I’d say so. I don’t really have a choice about it but I’d say that doing a lot of different creative projects helps keep me feeling enthusiastic about things. If I’ve been making a record, the following months I’ll turn to video or painting. Recently it’s been a lot of animation and 3D world building. Is striking a balance between day-to-day responsibilities, like work, with your art difficult? My work consists solely of art and music. When I’m not making records I’m a freelance animator, graphic designer, illustrator. I sometimes teach hand drawn animation, make music videos for other bands, design their merch. So it’s less finding a balance between the two as they are one and the same for me. It's more about finding ways to make money and stay afloat in a creative industry that lacks funding and has come to a place where artists and musicians aren't paid for their work in the same way people in other industries are. It’s been a few years since ‘Welcome To Milk’. Have you spent the whole time writing the new record or were you focused on other projects? ‘Lung Bread For Daddy’ was written in about four weeks. The rest of the time was spent either producing the record, making animated music videos for other artists, just making weird art or comics. My main income comes from my online store where I sell original artwork, comics and tees so I work hard to keep that stocked up with new stuff. Another aspect is that it can take a while to find a record a home. I'm lucky to have found Moshi Moshi, who are releasing the album. It's hard to find a label who will let you do what you want to how you want it so I'm grateful to have met those guys and be able to work with them. The years since ‘Welcome Back To Milk’ have seen an overhaul in the way I work and who I work with and I'm just very grateful to be working with people who support me as who I am, including my management. It seems that having creative control is extremely important to you, and rightly so. Do you think this is the way you’ll always work from now on? Absolutely. Since I started playing music at 16 I’d wanted to produce it myself. I always had a very clear vision of how I wanted my music to sound. But the music industry has a way of trying to manoeuvre you in a direction that it thinks will sell you best. It’s important to remember that a huge part of that industry is built by middle aged white cishet men, trying to sell music to middle aged white cishet men. Although there is nothing wrong with including that demographic within an audience, for people like myself they should only be a small part of a wider audience that includes queer people like myself, trans folks, people of colour, the broke 18-year-old who’s experimenting with gender who wants to feel safe going to a show. My need to produce my own music comes not only from wanting control over how I look and sound in an industry that will often try it’s best to subdue that, but also so I can direct my music and art at the people I feel a kinship with. So yes, unless I collaborate on a project I will produce my own music from now on. You’ve said that the new album is sort of a meeting of ‘Yours Truly, Cellophane Nose’ and ‘Welcome Back To Milk’. How so? ‘Yours Truly, Cellophane Nose’ was the culmination of my first couple of years writing songs, and the first time I’d entered a studio, had access to a string quartet etc. I made full use of all of those things and like a kid in a candy shop I wanted to try everything. I love that record so much still, and I’m super proud of it, but my whole life the music I listened to was was along the lines of prog rock, punk, classic rock, psych, a lot of ‘60s and ‘70s stuff. I thought that came through with the first record but as it was released at the tale end of the alt-folk movement, a lot of people wrote about this ‘folk’ record I’d made and it just bummed me out that the things I love most about it weren’t being picked up on. Then I came out with ‘Welcome Back To Milk’. I went full force in the other direction, I was in a much angrier place in my life, I was picking up on a lot of negativity in the industry, I’d been through a couple of not so great relationships and I wanted to release my rage. It was seen as this new direction and totally different from the first record, when really the first album is littered with guitar solos, fuzz pedals, overdrive, and it closes with a punk track. So with ‘Lung Bread For Daddy’, I’ve released a lot of that rage, I’m using it in a way that is more productive to where I am right now in life, and I’m also bringing back in a lot of those elements from the first record like strings and synths and samples. 'Lung Bread For Daddy' is out on February 22 through Moshi Moshi. Click here to compare & buy Du Blonde Tickets at Stereoboard.com. 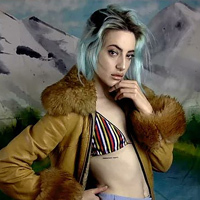 Du Blonde has shared a video for Raw Honey and announced a headline London show in 2016.